tablet coating – talc purified, propylene glycol, titanium dioxide, hypromellose. Diazepines, oxazepines and thiazepines. ATC code N05A H03. Olanzapine is an antipsychotic, antimanic, and mood stabilising agent that demonstrates a broad pharmacologic profile across a number of receptor systems. In two of two placebo- and two of three comparator-controlled trials with over 2,900 schizophrenic patients presenting with both positive and negative symptoms, Olanzapine was associated with statistically significantly greater improvements in negative as well as positive symptoms. In a multinational, double-blind, comparative study of schizophrenia, schizoaffective and related disorders, which included 1,481 patients with varying degrees of associated depressive symptoms (baseline mean of 16.6 on the Montgomery-Asberg Depression Rating Scale), a prospective secondary analysis of baseline to endpoint mood score change demonstrated a statistically significant improvement (P = 0.001) favouring Olanzapine (-6.0) versus haloperidol (-3.1). In patients with a manic or mixed episode of bipolar disorder, Olanzapine demonstrated superior efficacy to placebo and valproate semisodium (divalproex) in reduction of manic symptoms over 3 weeks. Olanzapine also demonstrated comparable efficacy results to haloperidol in terms of the proportion of patients in symptomatic remission from mania and depression at 6 and 12 weeks. In a co-therapy study of patients treated with lithium or valproate for a minimum of 2 weeks, the addition of Olanzapine 10mg (co-therapy with lithium or valproate) resulted in a greater reduction in symptoms of mania than lithium or valproate monotherapy after 6 weeks. In an 18-month co-therapy study in manic or mixed episode patients stabilised with Olanzapine plus a mood stabiliser (lithium or valproate), long-term Olanzapine co- therapy with lithium or valproate was not statistically significantly superior to lithium or valproate alone in delaying bipolar recurrence, defined according to syndromic (diagnostic) criteria. The experience in adolescents (ages 13 to 17 years) is limited to short-term efficacy data in schizophrenia (6 weeks) and mania associated with bipolar I disorder (3 weeks), involving less than 200 adolescents. Olanzapine was used as a flexible dose starting with 2.5 and ranging up to 20 mg/day. During treatment with olanzapine, adolescents gained significantly more weight compared with adults. The magnitude of changes in fasting total cholesterol, LDL cholesterol, triglycerides, and prolactin were greater in adolescents than in adults. There are no data on maintenance of effect and limited data on long-term safety. Olanzapine is metabolised in the liver by conjugative and oxidative pathways. The major circulating metabolite is the 10-N-glucuronide, which does not pass the blood brain barrier. Cytochromes P450-CYP1A2 and P450-CYP2D6 contribute to the formation of the N-desmethyl and 2-hydroxymethyl metabolites; both exhibited significantly less in vivo pharmacological activity than Olanzapine in animal studies. The predominant pharmacologic activity is from the parent, Olanzapine. In healthy elderly (65 and over) versus non-elderly subjects, the mean elimination half-life was prolonged (51.8 versus 33.8 hours) and the clearance was reduced (17.5 versus 18.2 l/hr). The pharmacokinetic variability observed in the elderly is within the range for the non-elderly. In 44 patients with schizophrenia >65 years of age, dosing from 5 to 20mg/day was not associated with any distinguishing profile of adverse events. In female versus male subjects, the mean elimination half-life was somewhat prolonged (36.7 versus 32.3 hours) and the clearance was reduced (18.9 versus 27.3 l/hr). However, Olanzapine (5-20mg) demonstrated a comparable safety profile in female (n = 467) as in male patients (n = 869). In smoking subjects with mild hepatic dysfunction, mean elimination half-life (39.3 hours) was prolonged and clearance (18.0 l/hr) was reduced analogous to non- smoking healthy subjects (48.8 hours and 14.1 l/hr, respectively). In non-smoking versus smoking subjects (males and females), the mean elimination half-life was prolonged (38.6 versus 30.4 hours) and the clearance was reduced (18.6 versus 27.7 l/hr). Olanzapine is effective in maintaining the clinical improvement during continuation therapy in patients who have shown an initial treatment response. Olanzapine is indicated for the treatment of moderate to severe manic episode. Schizophrenia: The recommended starting dose for Olanzapine is 10mg/day. Manic episode: The starting dose is 15mg as a single daily dose in monotherapy or 10mg daily in combination therapy. Preventing recurrence in bipolar disorder: The recommended starting dose is 10mg/day. For patients who have been receiving Olanzapine Accord for treatment of manic episode, continue therapy for preventing recurrence at the same dose. If a new manic, mixed, or depressive episode occurs, Olanzapine treatment should be continued (with dose optimization as needed), with supplementary therapy to treat mood symptoms, as clinically indicated. During treatment for schizophrenia, manic episode, and recurrence prevention in bipolar disorder, daily dosage may subsequently be adjusted on the basis of individual clinical status within the range 5-20mg/day. An increase to a dose greater than the recommended starting dose is advised only after appropriate clinical reassessment and should generally occur at intervals of not less than 24 hours. Olanzapine can be given without regard for meals, as absorption is not affected by food. Gradual tapering of the dose should be considered when discontinuing Olanzapine. Olanzapine is not recommended for use in children and adolescents below 18 years of age due to a lack of data on safety and efficacy. A greater magnitude of weight gain, lipid and prolactin alterations has been reported in short-term studies of adolescent patients than in studies of adult patients. Elderly patients: A lower starting dose (5mg/day) is not routinely indicated but should be considered for those 65 and over when clinical factors warrant. Patients with renal and/or hepatic impairment: A lower starting dose (5mg) should be considered for such patients. In cases of moderate hepatic insufficiency (cirrhosis, Child-Pugh class A or B), the starting dose should be 5mg and only increased with caution. Gender: The starting dose and dose range need not be routinely altered for female patients relative to male patients. Smokers: The starting dose and dose range need not be routinely altered for non- smokers relative to smokers. Along with its needed effects, olanzapine may cause some unwanted effects. Although not all of these side effects may occur, if they do occur they may need medical attention. – unusual weight gain or loss. – weakness of the arms and legs. Hypersensitivity to the active substance or to any of the excipients. Patients with known risk for narrow-angle glaucoma. During antipsychotic treatment, improvement in the patient’s clinical condition may take several days to some weeks. Patients should be closely monitored during this period. Olanzapine is not approved for the treatment of dementia-related psychosis and/or behavioural disturbances and is not recommended for use in this particular group of patients because of an increase in mortality and the risk of cerebrovascular accident. In placebo-controlled clinical trials (6-12 weeks duration) of elderly patients (mean age 78 years) with dementia-related psychosis and/or disturbed behaviours, there was a 2-fold increase in the incidence of death in olanzapine treated patients compared to patients treated with placebo (3.5% vs. 1.5%, respectively). The higher incidence of death was not associated with olanzapine dose (mean daily dose 4.4 mg) or duration of treatment. Risk factors that may predispose this patient population to increased mortality include age > 65 years, dysphagia, sedation, malnutrition and dehydration, pulmonary conditions (e.g., pneumonia, with or without aspiration), or concomitant use of benzodiazepines. However, the incidence of death was higher in olanzapine- treated than in placebo-treated patients independent of these risk factors. In the same clinical trials, cerebrovascular adverse events (CVAE e.g., stroke, transient ischaemic attack), including fatalities, were reported. There was a 3-fold increase in CVAE in patients treated with olanzapine compared to patients treated with placebo (1.3% vs. 0.4%, respectively). All olanzapine- and placebo-treated patients who experienced a cerebrovascular event had pre-existing risk factors. Age > 75 years and vascular/mixed type dementia were identified as risk factors for CVAE in association with olanzapine treatment. The efficacy of olanzapine was not established in these trials. The use of olanzapine in the treatment of dopamine agonist associated psychosis in patients with Parkinson’s disease is not recommended. In clinical trials, worsening of Parkinsonian symptomatology and hallucinations were reported very commonly and more frequently than with placebo (see section 4.8), and olanzapine was not more effective than placebo in the treatment of psychotic symptoms. In these trials, patients were initially required to be stable on the lowest effective dose of anti-Parkinsonian medicinal products (dopamine agonist) and to remain on the same anti-Parkinsonian medicinal products and dosages throughout the study. Olanzapine was started at 2.5 mg/day and titrated to a maximum of 15 mg/day based on investigator judgement. NMS is a potentially life-threatening condition associated with antipsychotic medicinal products. Rare cases reported as NMS have also been received in association with olanzapine. Clinical manifestations of NMS are hyperpyrexia, muscle rigidity, altered mental status, and evidence of autonomic instability (irregular pulse or blood pressure, tachycardia, diaphoresis, and cardiac dysrhythmia). Additional signs may include elevated creatinine phosphokinase, myoglobinuria (rhabdomyolysis), and acute renal failure. If a patient develops signs and symptoms indicative of NMS, or presents withunexplained high fever without additionalclinical manifestations of NMS, all antipsychotic medicines, including olanzapine must be discontinued. Hyperglycaemia and/or development or exacerbation of diabetes, occasionally associated with ketoacidosis or coma, has been reported rarely, including some fatal cases. In some cases, a prior increase in body weight has been reported, which may be a predisposing factor. Appropriate clinical monitoring is advisable in accordance with utilised antipsychotic guidelines, e.g. measuring of blood glucose at baseline, 12 weeks after starting olanzapine treatment and annually thereafter. Patients treated with any antipsychotic agents, including olanzapine, should be observed for signs and symptoms of hyperglycaemia (such as polydipsia, polyuria, polyphagia, and weakness) and patients with diabetes mellitus or with risk factors for diabetes mellitus should be monitored regularly for worsening of glucose control. Weight should be monitored regularly, e.g. at baseline, 4, 8 and 12 weeks after starting olanzapine treatment and quarterly thereafter. Undesirable alterations in lipids have been observed in olanzapine-treated patients in placebo-controlled clinical trials (see section 4.8). Lipid alterations should be managed as clinically appropriate, particularly in dyslipidemic patients and in patients with risk factors for the development of lipids disorders. Patients treated with any antipsychotic agents, including olanzapine, should be monitored regularly for lipids in accordance with utilised antipsychotic guidelines, e.g. at baseline, 12 weeks after starting olanzapine treatment and every 5 years thereafter. Transient, asymptomatic elevations of hepatic aminotransferases, ALT, AST have been seen commonly, especially in early treatment. Caution should be exercised and follow-up organized in patients with elevated ALT and/or AST, in patients with signs and symptoms of hepatic impairment, in patients with pre-existing conditions associated with limited hepatic functional reserve, and in patients who are being treated with potentially hepatotoxic medicines. In cases where hepatitis (including hepatocellular, cholestatic or mixed liver injury) has been diagnosed, olanzapine treatment should be discontinued. Caution should be exercised in patients with low leucocyte and/or neutrophil counts for any reason, in patients receiving medicines known to cause neutropenia, in patients with a history of drug-induced bone marrow depression/toxicity, in patients with bone marrow depression caused by concomitant illness, radiation therapy or chemotherapy and in patients with hypereosinophilic conditions or with myeloproliferative disease. Neutropenia has been reported commonly when olanzapine and valproate are used concomitantly . Given the primary CNS effects of olanzapine, caution should be used when it is taken in combination with other centrally acting medicines and alcohol. As it exhibits in vitro dopamine antagonism, olanzapine may antagonise the effects of direct and indirect dopamine agonists. Olanzapine should be used cautiously in patients who have a history of seizures or are subject to factors which may lower the seizure threshold. Seizures have been reported to occur rarely in patients when treated with olanzapine. In most of these cases, a history of seizures or risk factors for seizures were reported. In comparator studies of one year or less duration, olanzapine was associated with a statistically significant lower incidence of treatment emergent dyskinesia. However; the risk of tardive dyskinesia increases with long-term exposure, and therefore if signs or symptoms of tardive dyskinesia appear in a patient on olanzapine, a dose reduction or discontinuation should be considered. These symptoms can temporally deteriorate or even arise after discontinuation of treatment. Postural hypotension was infrequently observed in the elderly in olanzapine clinical trials. As with other antipsychotics, it is recommended that blood pressure is measured periodically in patients over 65 years. Olanzapine is not indicated for use in the treatment of children and adolescents. Studies in patients aged 13-17 years showed various adverse reactions, including weight gain, changes in metabolic parameters and increases in prolactin levels. Long- term outcomes associated with these events have not been studied and remain unknown . Very common symptoms in overdose (> 10% incidence) include tachycardia, agitation/aggressiveness, dysarthria, various extrapyramidal symptoms, and reduced level of consciousness ranging from sedation to coma. There is no specific antidote for Olanzapine. Induction of emesis is not recommended. Standard procedures for management of overdose may be indicated (ie, gastric lavage, administration of activated charcoal). The concomitant administration of activated charcoal was shown to reduce the oral bioavailability of Olanzapine by 50 to 60%. Symptomatic treatment and monitoring of vital organ function should be instituted according to clinical presentation, including treatment of hypotension and circulatory collapse and support of respiratory function. Do not use epinephrine, dopamine, or other sympathomimetic agents with beta-agonist activity, since beta stimulation may worsen hypotension. Cardiovascular monitoring is necessary to detect possible arrhythmias. Close medical supervision and monitoring should continue until the patient recovers. Neonates exposed to antipsychotics (including Olanzapine) during the third trimester of pregnancy are at risk of adverse reactions including extrapyramidal and/or withdrawal symptoms that may vary in severity and duration following delivery. There have been reports of agitation, hypertonia, hypotonia, tremor, somnolence, respiratory distress, or feeding disorder. Consequently, newborns should be monitored carefully. In a study in breast-feeding, healthy women, Olanzapine was excreted in breast milk. Mean infant exposure (mg/kg) at steady-state was estimated to be 1.8% of the maternal Olanzapine dose (mg/kg). Patients should be advised not to breast-feed an infant if they are taking Olanzapine. Induction of CYP1A2: The metabolism of Olanzapine may be induced by smoking and carbamazepine, which may lead to reduced Olanzapine concentrations. Only slight to moderate increase in olanzapine clearance has been observed. The clinical consequences are likely to be limited, but clinical monitoring is recommended and an increase of Olanzapine dose may be considered if necessary (see section 4.2). Inhibition of CYP1A2: Fluvoxamine, a specific CYP1A2 inhibitor, has been shown to significantly inhibit the metabolism of Olanzapine. The mean increase in Olanzapine Cmax following fluvoxamine was 54% in female non-smokers and 77% in male smokers. The mean increase in Olanzapine AUC was 52% and 108%, respectively. A lower starting dose of Olanzapine should be considered in patients who are using fluvoxamine or any other CYP1A2 inhibitors, such as ciprofloxacin. A decrease in the dose of Olanzapine should be considered if treatment with an inhibitor of CYP1A2 is initiated. 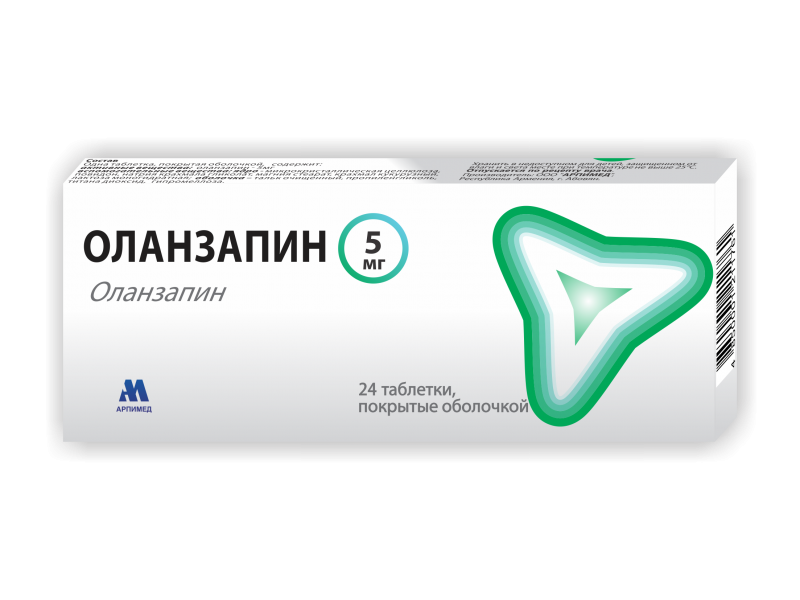 Decreased bioavailability: Activated charcoal reduces the bioavailability of oral Olanzapine by 50 to 60% and should be taken at least 2 hours before or after Olanzapine. Olanzapine does not inhibit the main CYP450 isoenzymes in vitro (eg, 1A2, 2D6, 2C9, 2C19, 3A4). Thus, no particular interaction is expected, as verified through in vivo studies, where no inhibition of metabolism of the following active substances was found: tricyclic antidepressant (representing mostly CYP2D6 pathway), warfarin (CYP2C9), theophylline (CYP1A2), or diazepam (CYP3A4 and 2C19). Olanzapine showed no interaction when co-administered with lithium or biperiden. Therapeutic monitoring of valproate plasma levels did not indicate that valproate dosage adjustment is required after the introduction of concomitant Olanzapine. The concomitant use of olanzapine with anti-Parkinsonian medicinal products in patients with Parkinson’s disease and dementia is not recommended (see section 4.4). White or white off biconvex film-coated tablets. 1 blister packet with 24 tablets and leaflet inserted in the cardboard box.